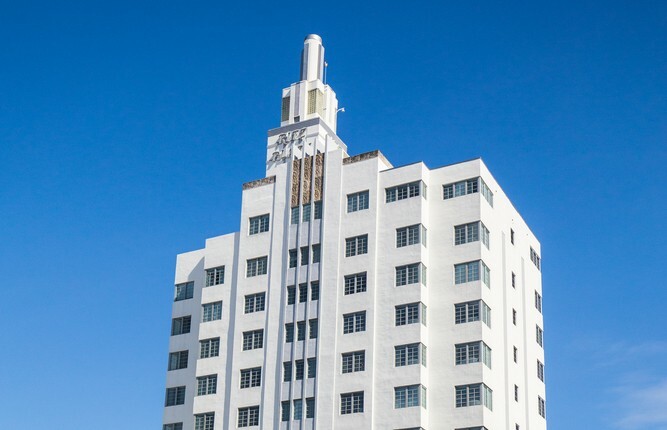 sls beach concession goes 100% "reusable"
The SLS is the first Miami Beach concessionaire to go 100% reusable for its serving pieces and that’s good for all of us… even if you don’t eat there. When Beach Maintenance Director John Ripple was looking for ways to reduce the amount of trash left in cans and on the sand in general, he approached some of the hoteliers that serve food and drinks on the beach. He found a receptive audience in SLS Managing Director Simon Sorpresi. He said Ripple and his team were direct but fair about the problem. Sorpresi said he was not aware that the County picks up the trash on the beach and that they had to buy additional machines because they were overburdened. The trash is actually the hotel’s responsibility, he said. “From an operational perspective, that’s a difficult undertaking” without the special equipment needed to empty the 90 gallon trash barrels. “It was a very fair approach from the City,” Sorpresi said. “John presented it in a very elegant fashion – brainstorming – but it was really his idea about the reusable part.” He echoes Ripple’s presentations about recyclable and biodegradable items still ending up in the trash or in the ocean. Reusables not only reduce the amount of trash, they are far more environmentally friendly. Sorpresi, who’s been in Miami Beach for 11 months, previously lived and worked in Santa Monica for many years. Because of his time there, he said he is very much in tune with environmental sustainability. “To use a food and beverage term,” he said, “I was more marinated in that.” When Ripple approached him in February, the SLS was already at 75% reusable service on the beach. After the first meeting, Sorpresi knew he could use the City’s pitch to help his team buy in to going the rest of the way. “I thought it fits perfectly into my intention,” he said. “It helped me sell it to my team, tell them the government is trying to reduce the trash and I want to go to 100% [reusable]. “Nobody really likes change,” he explained. “It’s human nature.” Initially it took some convincing as reusables mean “more shelpping” for the servers but after some changes in staffing to include more restaurant experience, he said it was a smooth transition. "In a restaurant you are never empty-handed.” Serving staff takes food to the table and then cleans plates off the table. It's the same concept with reusable serving pieces on the beach. 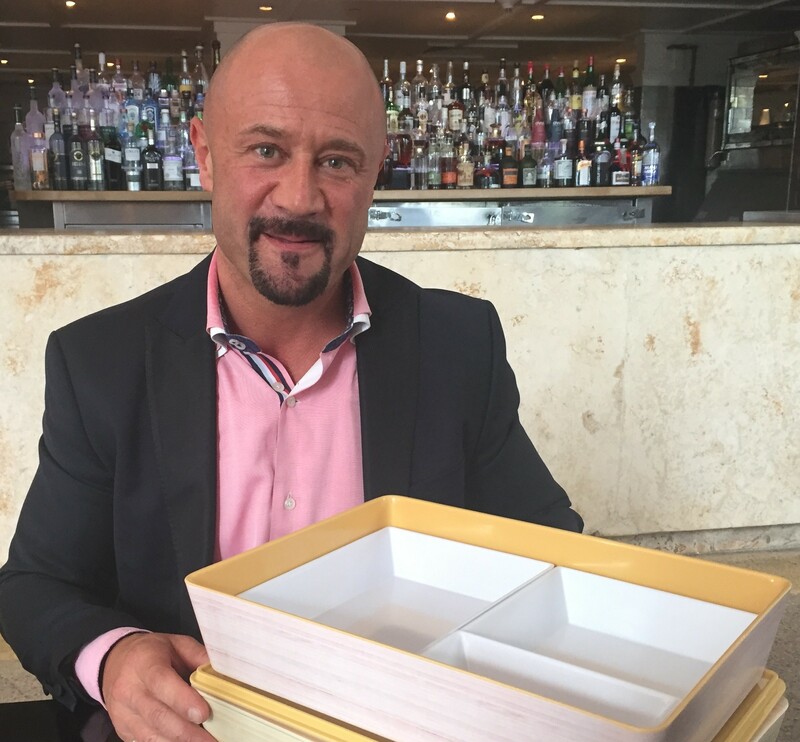 SLS Managing Director Simon Sorpresi with melamine serving pieces used for SLS beach food service. If for some reason the melamine is found in the sand, he said, the beach cleanup team is trained to know that they are the SLS’ dishes so they don’t end up in the trash. The move to reusables took some work. SLS had to get the design right, ensuring smaller items could be served on dishes that wouldn’t slide around in a large serving tray. And it’s costly. Depending on the season, recyclable materials cost about $900 a month. (“And it gets thrown away,” he added.) Though the “high-end melamine is quite expensive,” Sorpresi indicated he expects a return on investment in three months.